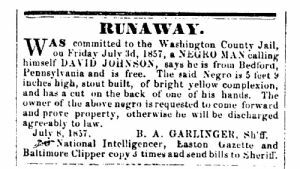 July 8, 1857. B.A. GARLINGER, Sh’ff. National Intelligencer, Easton Gazette and Baltimore Clipper copy 3 times and send bills to Sheriff.